The Nay region stretches from Lestelle de Betharram to Arthez d'Asson. This area, rich in local history, offers visitors a variety of historical, gastronomic and craft tours. Located half way between Pau and Lourdes, Nay is a bastide town built in 1302 by the viscountess of Béarn, Marguerite de Moncade. 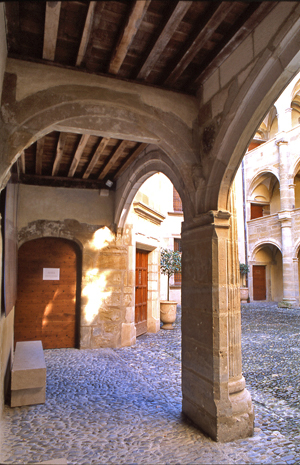 The bastides were mainly trading towns selling regional products and promoting local crafts. Its market, created by Gaston Phébus, still exists and the stalls are varied. There are many spinning and weaving mills, including one making berets. Visitors strolling the streets of Nay can see its history in the traditional Bearn architecture from the Middle Ages and the industrial development at the end of the 19th century. 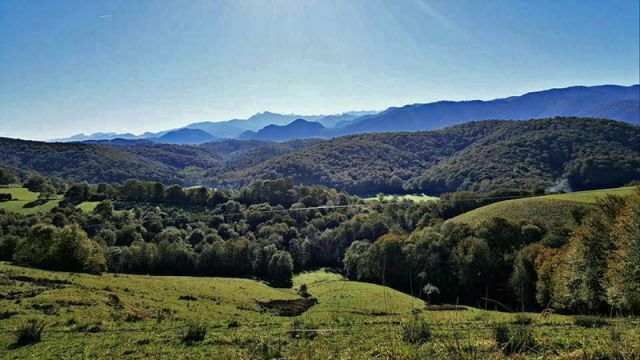 At the foothill of the Pyrenees Mountains, on the Gave de Pau banks, it is an ideal location for nature lovers wishing to recharge their batteries. 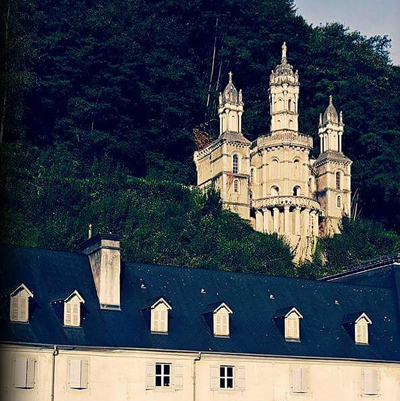 Lourdes has been a Catholic pilgrimage centre since the middle of the 19th century. It is a few kilometres from Nay. Each year Lourdes welcomes millions of visitors and pilgrims from around the world. In 1858 the Virgin Mary is said to have appeared several times to Bernadette Soubirous in the Massabielle Cave. Seventeen other apparitions followed and sanctuaries began to be created. 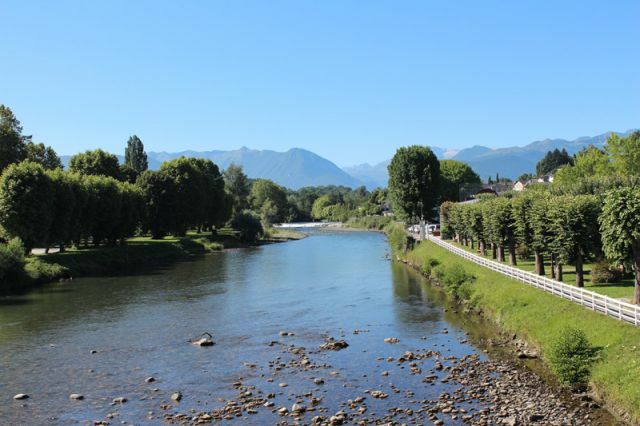 The town, located at the juncture of several valleys, close by the Gave de Pau, offers visitors the opportunity to discover the flora and fauna of the region as well as many cultural activities. Visit the fortified castle overlooking the Pic du Midi de Bigorre (2,876 metres – 9,435 feet), its panoramic terrace and the three basilicas of Lourdes: the Basilica of the Immaculate Conception, the Basilica of Notre-Dame du Rosaire and finally the Basilica of Saint Pie X. This is the last village separating Béarn and Bigorre. Lestelle-Bétharram is a bastide town established in 1335 by Gaston II de Foix. The town of Lestelle-Bétharram has evolved from the original town of the Middle Ages with grid-patterned streets and the large Saint-Jean square. It is also a pilgrimage site. Legend says that a young girl was saved from drowning by the Virgin. A baroque style sanctuary was built during the 16th century. Pilgrims arrived in large numbers giving Lestelle-Bétharram the nickname of the "Holy Land". Do go inside to view the beautiful sculptures and paintings of Bearn gothic art. There is a choice of accommodation and restaurants, such as the hotel-restaurant "Le vieux Logis", a famous restaurant offering traditional dishes with products from the Nay region producers. Lestelle-Bétharram has many sporting activities. Visit the Saillet Base de Loisirs Leisure activities. There are hiking paths to walk and fishing in white waters. Relax while having fun. Located at the foothill of the Pyrenees, this Leisure Activity Centre, which is also a campsite, offers many activities such as rafting and canoeing. Ohlala Eaux Vives provides paddleboards, tubing and hydrospeed to provide fun while admiring the Pyrenees. Made in Béarn! The Basque beret was knitted by shepherds before being factory made in Oloron from 1800. 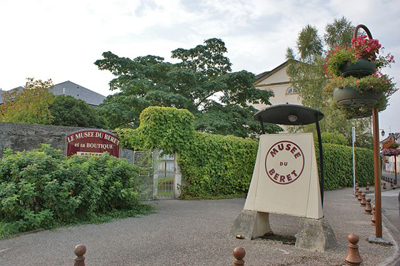 In Nay there is a beret museum, the only one in the world! It is worth a visit. You can learn about the history of the beret and the secrets in the making of this hat. Today the Basque beret is exported all over the world. The Nay region also has one of the last bell-manufacturing workshops. The Maison Daban produces metal sheets to make bells for the Pyreneans herds. These are genuine musical instruments for livestock. Bell making is skilled work which visitors can see through videos and guided tours of the workshops. The Maison Daban is a legacy of an old skill developed in Nay over many generations. The Nay region also showcases its local products and gastronomy. There are specialties which are valued by producers, restaurants and markets. Many of the companies whose labels you see on their products open their doors to the public and so share their passion for the gastronomy of Béarn. Cheese, charcuteries, honey, conserves and other local products can be found on sale direct from the farm or from market stalls. La ferme de la Hèche, located at the heart of the Ouzom Valley, offers its visitors various goat products: tome, tomettes and crottins. 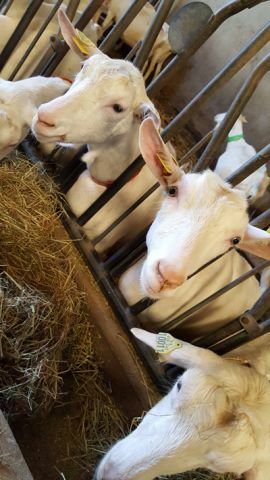 Visits to a goat farm are recommended to help visitors understand the cheese making process from milk, through the refining operation to the finished product. Your visit will end with a tasting session of many different goat products. 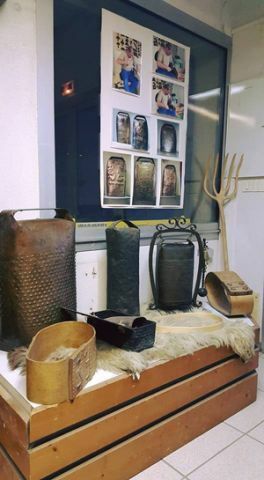 Other places, such as the honey farm le Rucher du Mourle, welcomes visitors to to see their operation showing the large choice of products offered in the Nay region. The Nay region offers a wide choice of leisure activities. We can suggest visits to: Maison Carrée located at the heart of the bastide town of Nay. This 16th century building, listed as a historic monument, houses the Museum of Industry. Its Italian Renaissance style architecture makes this house a must-see in Nay. 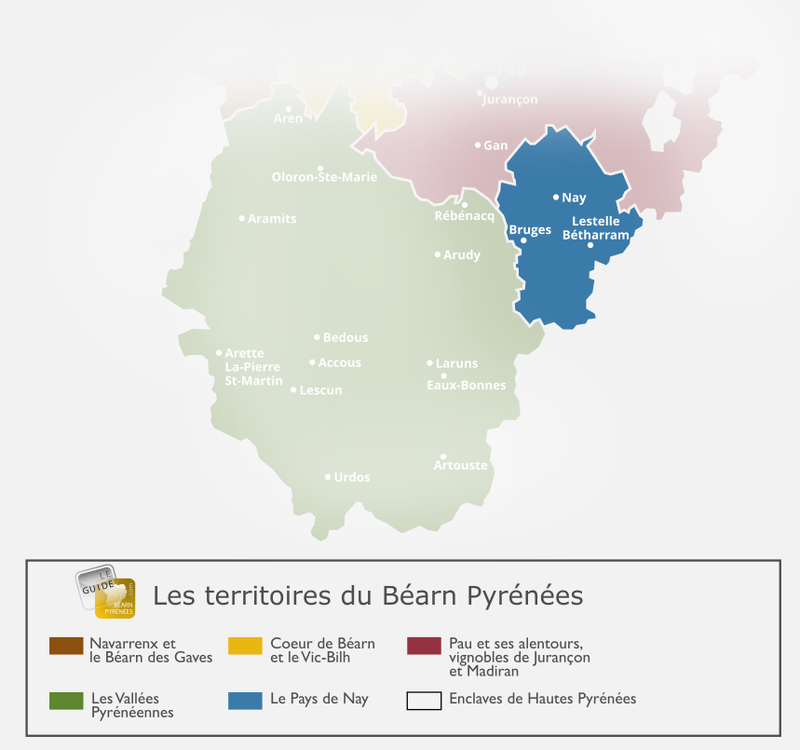 The history of Bearn's rural industry and its relations with the surrounding landscapes is explained here. 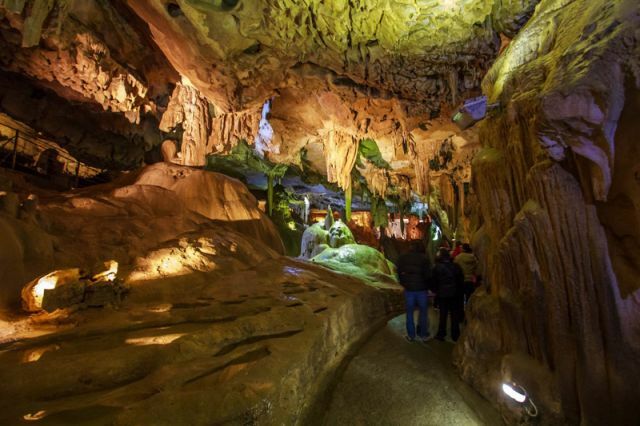 The Bétharram Caves, opened to the public in 1903, are also a unique place to visit. See the beauty found inside the mountain and discover this series of caves by foot, by boat and by little train. Nature lovers and nature enthusiasts will enjoy the Baudreix Lake. Sandy beach, slides, water sports, hiking paths and other walks are open to the visitors in an outstanding setting. The leisure activity centre les Ôkiri offers thrills with water- téléski and the Water Jump Drop In. The Ôkiri also has accommodation (mobile-homes, chalets and wooden cabins) and restaurants, including a floating restaurant, which offers unforgettable moments for you with your family or friends.